Longer days, milder temperatures and finally a taste of Summer. Sorrento and the Amalfi Coast revive after the cold season and for many visitors May is the best month to visit this corner of paradise. From cultural activities, outdoors experiences and hiking trips, find out more on this post and share your opinions if you have been on holiday in Southern Italy in the month of May. With their stunning scenery and beautiful landscapes, Sorrento and the Amalfi Coast show their most fascinating side during the month of May. The mild temperatures, sunny days and the Mediterranean atmosphere are three fundamental factors to enjoy your holiday in the South of Italy. During the month of May, beach clubs in Sorrento are open, the streets of the old town are crowded and the restaurateurs set up tables outside, along the main street Corso Italia and on the piers. 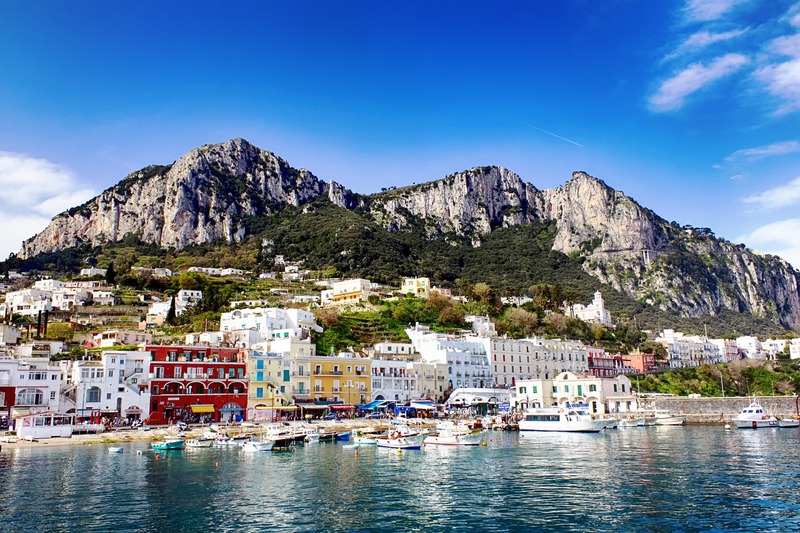 Sorrento is the largest village of the Coast and with its useful services and the best transportation connections it is the best choice as your base to visit the Pompeii Ruins, Amalfi Coast or Capri with one of the best local drivers or skippers we suggest. Capri is Italy’s most famous island, with its attractions and magical atmosphere it is known as the island of dreams and it is a must to visit by boat. We strongly recommend you contact us in advance for the Capri tour from Sorrento. During summer the demand is high and you risk not being able to book. We recommend two local skippers both English speaking, experienced and professional, who always make our guests feel special on the Capri daily tour. Considered the best period to visit Sorrento, May offers longer and sunnier days and anticipates a taste of Summer. The beach clubs and beaches in Sorrento and Amalfi Coast have now set up everything to accommodate guests. If you enjoy sunbathing do not forget to bring with you a swimsuit and beach towel. The sea temperature is much more enjoyable now and if you want to relax, you can spend a day in Marina Piccola or simply enjoy a lunch in front of the spectacular Gulf of Naples. Do not forget to leave space in your suitcase for a swimming costume and a towel, the water in May is warmer in Sorrento and Amalfi Coast. If you still feel cold and want to spend an entire day at the beach we suggest you to go to Meta di Sorrento or in Marina del Cantone, both beaches are protected from the wind and are exposed south, where you can swim and spend a pleasant day by the sea. In Sorrento Marina Piccola, there are four private beach clubs: Peter’s Beach, Marameo, Leonelli’s Beach and da Salvatore where you can rent a sun lounger or chair and umbrella for around €12. They all offer restaurants or snack bars, where you can order amazing sandwiches, pizzas or saltimbocca. It is very easy to reach the beaches in Sorrento, both in Marina Grande and Marina Piccola, for those staying in a Guesthouse, Holiday home or Hotel in the centre of Sorrento, the distance is very short, you just have to walk to the Public Gardens ( Villa Comunale) and from there either use the lift (cost per adult per ride €1.80 or use the steps. For those who have a car or scooter you must head towards the Sorrento Harbour (Porto di Sorrento) where you will find a space to park your vehicle in one of the two private car parks. To enjoy the night life, Piazza Tasso the main square and the old town, which are alive with restaurants, cafes and little clubs.